September, when Pudding starts school, suddenly seems awfully close. I suppose most parents probably face some anxiety around this time, but possibly even more so when your child has additional needs. Occasionally I have had little wobbles about our decision to send him to our local mainstream school; usually when somebody says, ‘You’re sending him to mainstream? Really?’ But that hasn’t happened very often. Mostly people have been very supportive, recognising the positives. One thing did happen a couple of weeks though that made me think we’re doing the right thing. After playing in our local park for a while following school run, I ended up leaving in tears when some other boys called Pudding ‘annoying’ and ‘weird’. To be fair, he was being annoying as he had apparently just spoilt the game they were playing. But it cut me to the quick. I watched him smiling and chatting at them for a while and I could see my sunny child inviting them to engage with him in the only way he knows how. To them, though, he was too obviously different. I knew at the time I should have used it as a teaching opportunity, explained to them why he was acting ‘weird’ and invited them to understand and accept him despite those differences. Rational behaviour isn’t always easy though. As I heard the words, and more importantly the tone in which they were said, I knew beyond a doubt that this would not be the last time I would be hurt like this. And it was me that was hurt, not him. He, thankfully, has no idea that the whole world doesn’t love him. Now, separated from the incident by a bit of time, I can understand why they acted the way they did. When you’re a kid, you learn the rules through play and socialisation and parental/teacher modelling. You learn to take turns and share, you learn to lead or follow at different times. You learn to gauge others’ strengths and abilities in games or challenges. You expect others to know the same rules and conform to them. And when someone comes along who is a bit different, it challenges all those norms of behaviour and acceptability. Like many people I grew up in a world where disability of any sort was very rarely seen. There would be the occasional TV programme that attempted to improve understanding, not always successfully – after Blue Peter featured the story of Joey Deacon, a man with severe cerebral palsy, children up and down the country used ‘Joey’ as the latest insult, copying his movements. I accepted this as normal, though as an adult now find it horrifying. (Not all adults seem to have learnt this awareness yet – Donald Trump notably using similar movements to mock a disabled journalist earlier this year). At university I volunteered with a great student organisation called KEEN which ran sporting and social activities for children with additional needs. (Having just checked the internet I can see there are other KEEN groups around the UK and US.) I found it a great experience, but when paired with someone who had more severe communication difficulties I sometimes felt uncomfortable. With little awareness about what their particular condition entailed I would be desperately afraid of either talking down to them or of not making myself clear enough. Now of course I have more knowledge and understanding. I would know to follow the lead of that child’s carer or have the confidence to simply ask. Things certainly are changing and people with disabilities are a lot more visible in society these days though there is still a long way to go. A few years ago there was huge controversy when a new presenter started work on the children’s channel, CBeebies. You might think why – were they a drug-user? Turning up drunk? Swearing on air? No, Cerrie was enthusiastic, well-presented and great at what she did – the only ‘problem’ was that she had been born with a limb difference which led to some parents complaining that their children were being traumatised. Yet young children are incredibly accepting. Pre-schoolers play happily with their peers who don’t share the same gender, abilities or ethnicity. I think it is only if they are not exposed to difference until later on that the suspicion of ‘otherness’ becomes apparent. The point I’m making is that the only way people (myself included) learn to relate better to those with disabilities is by seeing them – on TV and in person – on a daily basis. The children who go to school with Pudding will learn that yes, he is different, but that isn’t anything to be scared of. Hopefully they will grow up into better adults than I did. Believe me, I’m by no means sacrificing Pudding for an ideal of inclusivity. If mainstream appears not to be working for him, I will be more than willing to move him to the nearest special school (which we have already looked around). Until then, I simply believe that Pudding isn’t the only one who stands to benefit from his education. I have every confidence that he can teach others far more. For a long time now I’ve wondered whether we should be telling Twiglet more about MPS and what it means for his brother. Everything I had read about the subject suggests that the earlier a sibling knows about potential problems the better able they are to deal with it. Also, with Pudding going to the same school as him in September, inevitably more people will know about the diagnosis and there is always the possibility that someone, some day, will make an unthinking comment. I would never want to put him in the position of having to hear from an outsider what he should learn in the safety of our family. But really, how do you talk about life expectancy to a six year old? Every so often I have tried. I’ve edged the conversation round to Pudding and his condition and hoped that Twiglet would ask the question that could lead me into it. But that never happened. Me: Do you know what the treatment he’s having each week does? Me: Well, if he wasn’t having it, all the gunky stuff would be building up in his body – the heart, lungs, everywhere. So eventually they would stop working. T: So his heart wouldn’t be pumping blood around his body, and he wouldn’t have any more oxygen, and he’d stop being alive? Me: Yes, that’s right. But he’s getting that treatment now, to keep it all working. And the treatment that he’s getting in Manchester – we hope that will keep his brain working too. T: So he could get to be really old like me. Me: That would be good. But even if it does work well, he may not get to be as old as you, because all the gunky stuff will have done some damage already. T: OK. Can I have my Lego down now? Hmmm. A little easier than I expected, but don’t know that he really got the message. Hopefully though, that seed has been planted in his mind, and he’ll have a little more understanding and knows it’s something we can talk about. For now though, I’m resting a little easier. It’s all too easy sometimes to look at the interesting things other families get up to in the weekends and holidays and feel a twinge of jealousy. Think, ‘We could do that too if we didn’t have Pudding in tow’. Well perhaps now we’re starting to access some respite hours that will be possible. But also, there are some activities that have opened up to us simply because of Pudding’s special needs. 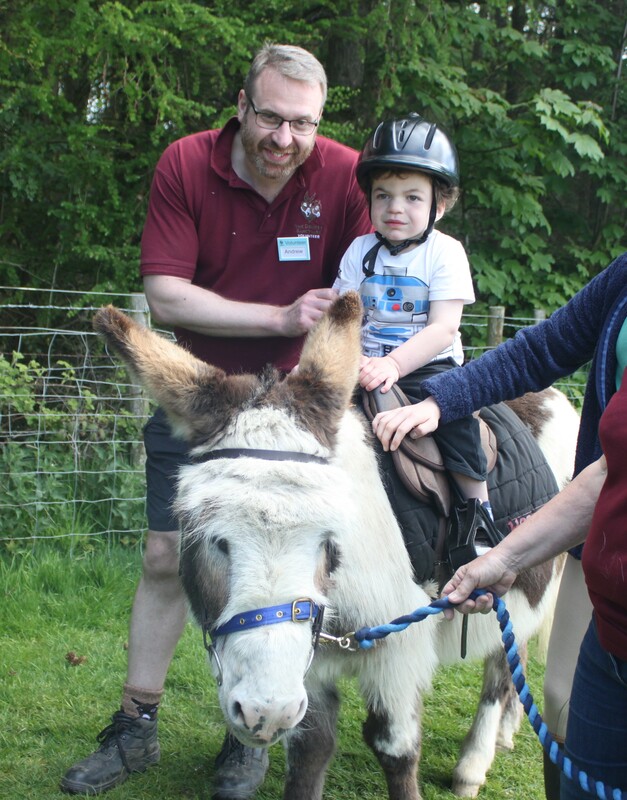 One of those is donkey riding at the Leeds Donkey Sanctuary. 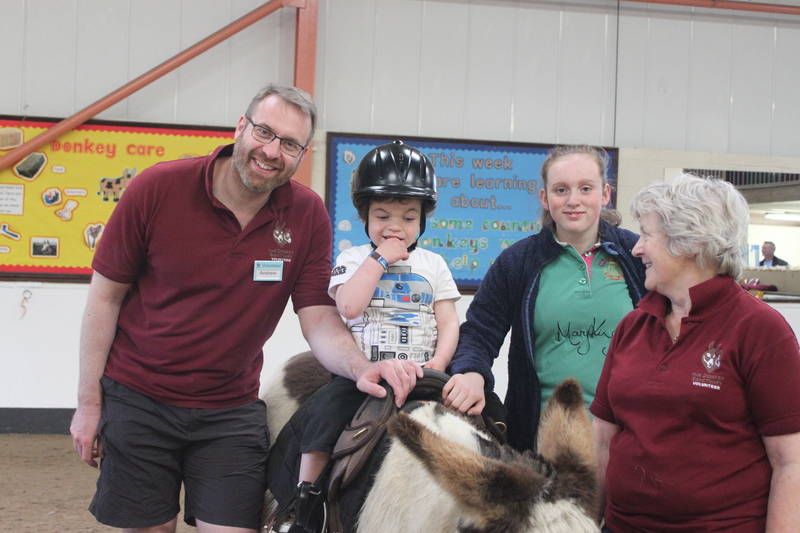 One Saturday every month (and extra dates in the holidays) they hold sessions for children with additional needs to come and interact with the donkeys. It was recommended to us by another mum and when we turned up the first time I had no idea what to expect. All I knew was that Pudding would be keen (as he loves animals), and Twiglet would probably steer very well clear (as he doesn’t). It’s a simple, no-frills, welcoming sort of place which is just perfect for what they do. After only a few times of going we quickly fell into a routine. First stop is the stable yard where we say hello to some of the donkeys and stroke them. And they are so very stroke-able with lovely soft hair and not as tall or scary as horses. Then we head inside to sign in and get our name stickers on. Just the other side of the hall there is a little outside play area with a swing and ride-on toys, which Pudding enjoys. 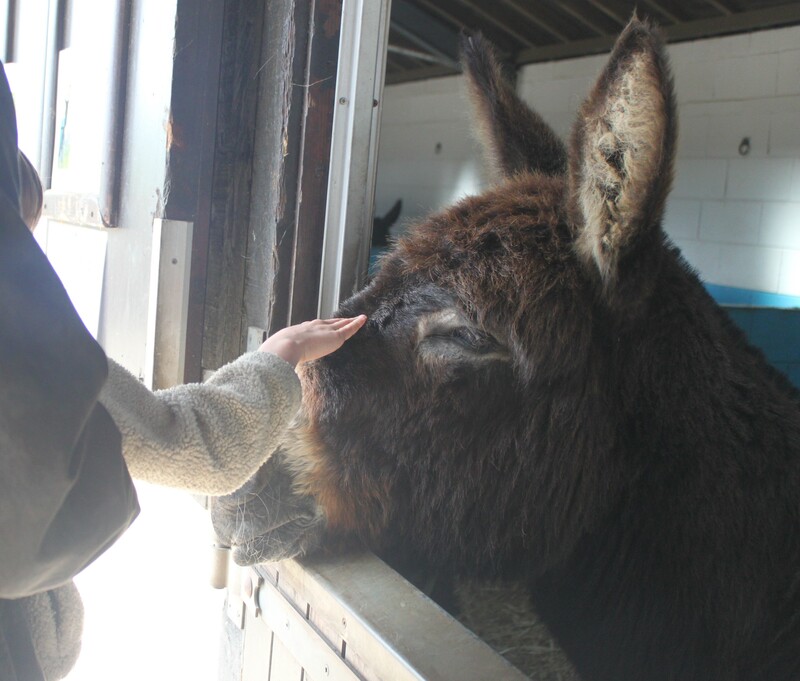 Mainly though, he runs around shouting loudly and making sure that everyone, staff and volunteers included, knows there are donkeys through in the main arena. Soon it’s time to get helmets on and have a turn riding. Siblings are able to have a go too, and much to our surprise, on the second visit Twiglet announced that he would. Donkeys are apparently much more acceptable than any other animal. They ride around the arena supported by careful assistants, and have little challenges on the way that promote learning: for instance collecting different colour balls and throwing them into the matching bucket. If nothing else, Pudding can at least do the throwing part. 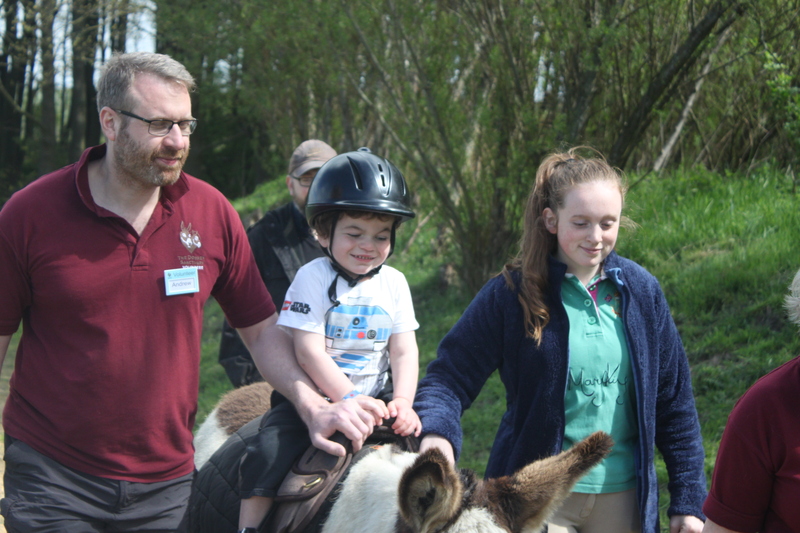 On our latest visit though (first sunny time there) we got a ride outside, walking up a little lane and back through a field, spotting birds, dogs and of course more donkeys on the way. Then it’s lunchtime (ok, I admit, it’s sometimes only 11am) – fried egg or bacon sandwiches keep us all happy. 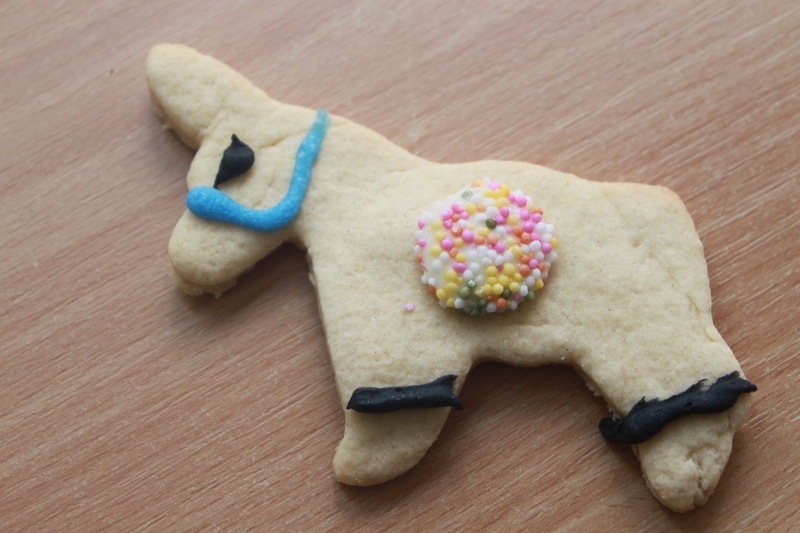 And if I’m feeling generous it is followed by a piece of cake or donkey biscuit. Then back in the car for a sleep on the way home. Nothing particularly exciting or adventurous ; on the surface not much to assuage that jealousy I feel when looking at other ‘normal’ families. So why do I like going so much? It’s because it’s an activity we can share and enjoy as a family. It’s because Pudding can now sign and say the word ‘donkey”. It’s the feeling of belonging, knowing that we’re accepted there – it doesn’t matter if Pudding runs about or misbehaves. The day finally arrived and we all did well Wearing It Blue – even Hubby who stayed at home all day and didn’t see anyone. The blue hair dye was somewhat unimpressive. I had hoped that it would take well on my white hairs (of which there are almost more than the dark ones these days) but I’ve basically ended up looking a little blue-tinged, rather than electric blue. But sparkly blue nails (thank you, Sister!) made up for it. I’ve loved seeing all the pictures on-line of friends, family and other MPS families wearing blue (or purple); coming together to show their support. Thank you, every single one of you! It seems appropriate that on MPS Awareness Day itself, Pudding has just had the best time being completely unaware of it all: running around with his brother and cousins, feeding his sandwich to the ducks, playing ball, running in the wrong direction and saying hello to strangers’ dogs. This is what life is all about. 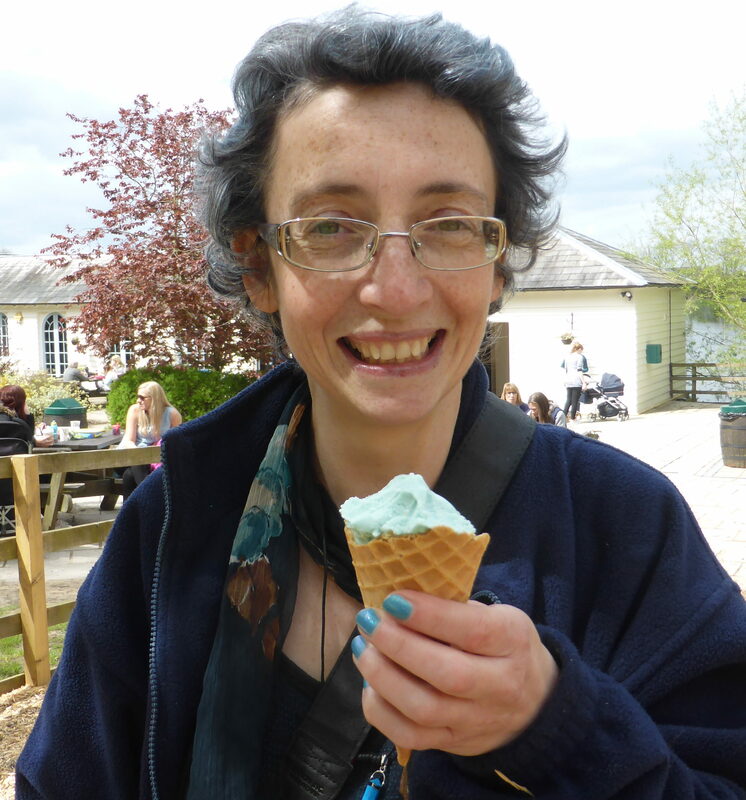 Oh, and I even had a blue ice-cream. When I saw ‘Blue Banana Blitz’ was one of the flavours on offer, I just had to! When a chance meeting leads to questions about Pudding I often say he has a genetic disorder that causes his development delay. People can be genuinely interested and ask for more information, wanting to know the name of the condition. My heart sinks a little – they won’t have heard of it, just like I hadn’t a year ago – but say the word anyway. Mucopolysaccharidosis. They look a little taken aback and ask what that means. Usually I give the official answer: it’s a progressive condition; due to a mistake on his DNA he is missing a vital enzyme; waste products build up all over his body causing a range of problems. But that explanation leaves so many blanks. 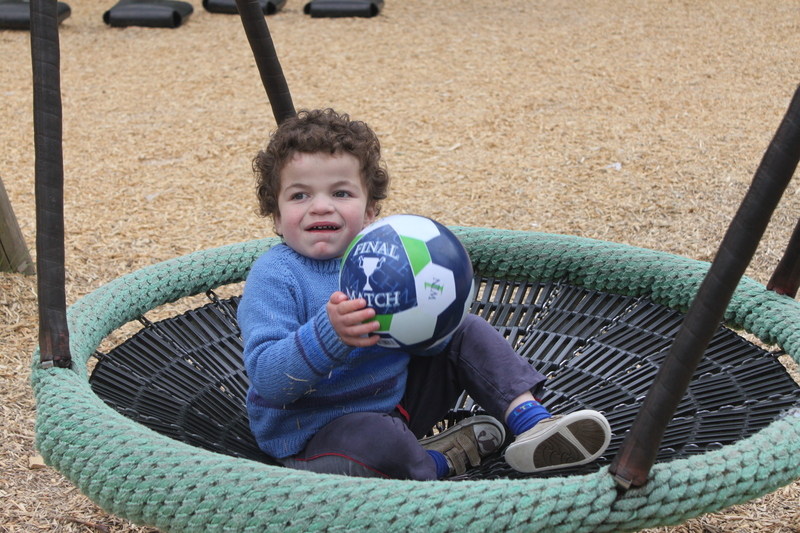 It fails to explain what MPS II (Hunter Syndrome) really means to us. It means pinning him down for needles and blood pressures and medicines every week. A four-hour infusion every week, for the rest of his life. It means feeling guilty. Guilt that I don’t do enough to stimulate him, guilt that I sometimes snap at him when it’s not his fault, guilt that I might have caused this whole thing by having him later in life. It means living with the possibility that our child will die before us. It means being grateful for every long-awaited milestone or achievement. It means becoming a walking calendar; balancing preschool and social outings with weekly ERT, trips to Manchester, appointments with occupational therapy, speech and language, physio, ENT, portage…the list goes on. It means mourning the expectations I once had for him of girlfriends, university, a good job and maybe children of his own. It means never leaving anything on any surface unless we’re happy for it to be thrown or eaten. It means pacing hospital corridors waiting for him to come round after another operation and dealing with his distress when he doesn’t understand why he is feeling so rotten. It means wondering each month whether his body will continue to tolerate the new drug that is our current best hope. It means feeling I have to be strong, but sometimes failing. It means every time I see his gorgeous round face I am reminded of the condition that has sculpted this broad nose and large forehead. It means being hit and kicked and pushed over by a boy whose size and strength is not matched by his understanding of how much he can hurt. It means having certain dates etched on my mind forever – the date we heard about MPS for the first time, the date he got the final diagnosis…. It means our world will never be the same again. It means tears. So many tears. It means giving in to the TV as babysitter far more often than I would like as sometimes nothing else will calm him down. It means learning to live in the moment and enjoy simple pleasures. It means watching him like a hawk when we’re out anywhere in case he hurts another child or simply runs off. It means grinning from ear to ear when I hear him chuckling at the TV, or a game of chase with his brother or when splashing in the bath. His laughter is so joyous and free. It means holding faith in the science of the future that could save lives. And being grateful beyond measure that this is a possibility for us when for many others it will have come too late. It means knowing the strength of love and support that we have from family and others. It means accepting a new normal over and over again. It means never knowing quite how to respond when his brother talks about what Pudding will be like when he’s grown-up. But of course, I don’t usually give those answers to the person asking. Because if I bared my heart in the playground, or the cafe, or wherever we are, I would probably never stop talking about it or I’d start crying. And I’m sure they don’t really want a soggy Hunters Mum on their hands. And after all, when it comes down to it, MPS is everything and nothing. Pudding is still our little round lump of gorgeousness and nothing – certainly not this diagnosis – will ever change that. I wasn’t actually intending to post here today, but Pudding and I had such a nice surprise this morning that I had to. It was one of those mornings where we got back from the school run and Pudding flitted from one toy to the next in a seamless flow. I tried to shoehorn in a little bit of teaching – ‘Yes, it’s a car, a RED car’ – in between avoiding getting hit, but after a while I looked at the clock and had one of those heart-sink moments when I saw it was only 9.15. (My fault. I was too tired to keep up the enthusiasm after another evening out. I know, get me!) After countless demands for TV or food, I gave in and got the tablet out. Even that wasn’t too successful as it kept stopping. Then I heard the creak of our gate and a knock on the side door. Our lovely infusion nurse had been walking her dog past our road and decided to call in and see us. Pudding was over the moon as he adores meeting animals. He was given charge of the lead and spent a happy ten minutes wandering around the garden with her, shouting ‘doggy!’ constantly. Simple pleasures! And then at gym club, for the second week running, he sat down through most of the register without me needing to hold onto him. How well a day can turn out after the most unpromising start! I know, I know. It seems like almost every week there is another awareness day, another cause tugging at your heart- and purse-strings. MPS Awareness Day is on the 15th May and I wanted to say a little about why it’s important to me. Obviously MPS is something I think about every day since I first heard about it a year ago, but why do I want to shout about it so much? I’m not really pushing fundraising this time, as I strong-armed so many of you into supporting my efforts in November. However if you’re feeling flush you can donate here. The MPS Society support families dealing with MPS in many ways. Grants are also made to research projects that look for new treatments and potential cures such as gene therapy. Vitally important even for us as the clinical trial Pudding is currently on is by no means an ideal solution. Another aim for awareness days is to spread more understanding about a condition. I’ve read some fantastic pieces educating readers about autism or the difficulties of living with an undiagnosed child, and know that these have the power to change the way I view random encounters. But for me, the reason I blog and the reason I am shouting about MPS on 15th May is simple. 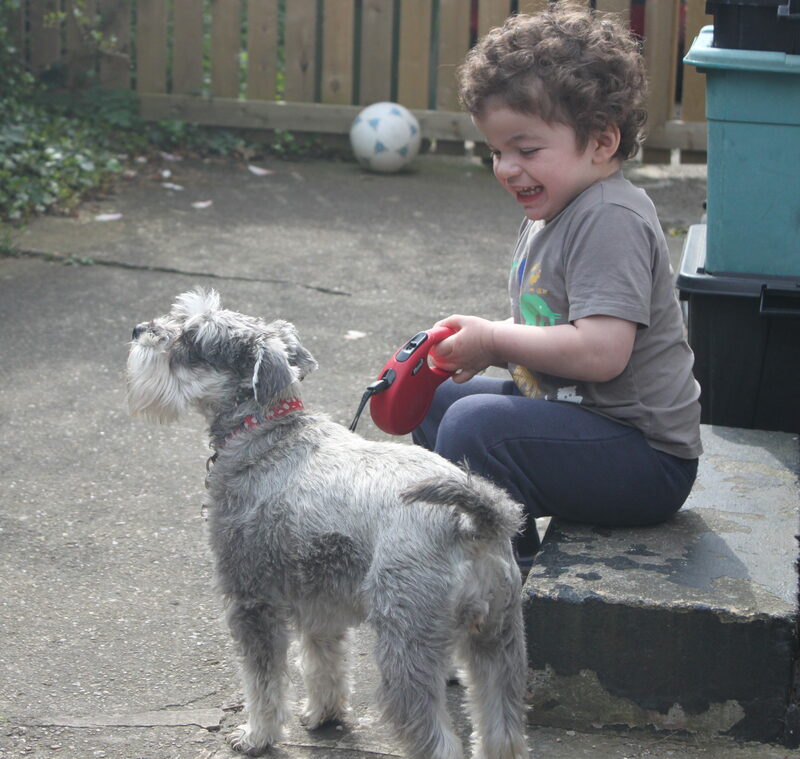 I’ve written on ‘It’s Me Ethan’ about how lucky we were to get Pudding diagnosed when he was. Many MPS families struggle for years to get answers for their child’s problems. If by our efforts to raise awareness we can help even one family find a diagnosis sooner then I will be happy. So please, if you can, share a post about MPS over the next few days – I don’t mind whether it’s one of mine or another – and ask your friends to as well. Maybe you don’t know anyone with similar symptoms. Maybe your friends don’t. But maybe somewhere a friend of a friend is worrying about their child’s development, sitting in yet another hearing appointment, phoning a speech and language therapist, thinking about their child’s distinctive facial features or wondering why trousers never fit round his big tummy. Maybe they will see a post about MPS and the penny will drop. Or maybe you know a health visitor, or nurse, or GP who regularly see children and could pick up on this rare condition. Early diagnosis means that those MPS conditions with existing treatments can start to be treated straight away before too much damage is done. It means that when clinical trials become available, families can have the chance to take part before the disease progresses too far. It can really make a difference.